The Drug Enforcement Administration has released the 2018 National Drug Threat Assessment, the agency’s annual report on drug trafficking and drug abuse in the United States. 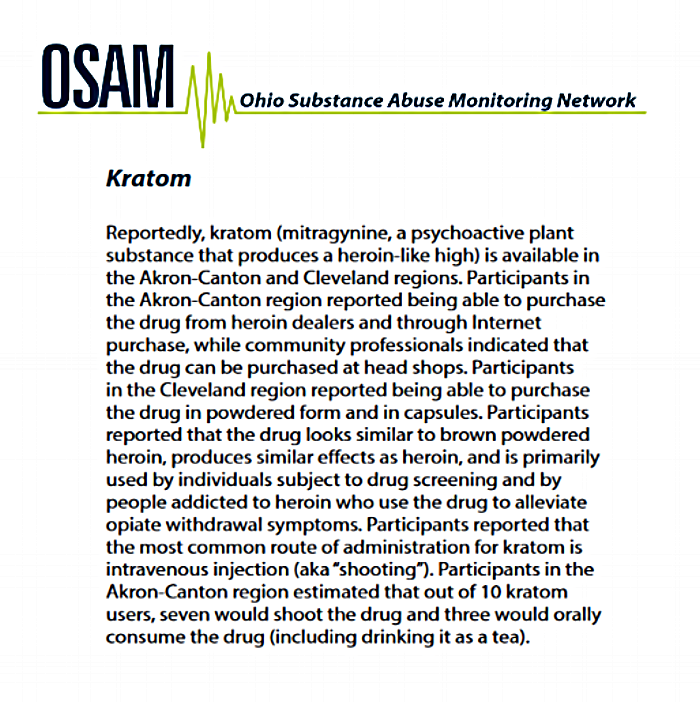 Conspicuously absent from the report is kratom, the herbal supplement that the FDA blames for dozens of fatal overdoses and the DEA once tried to list as a dangerous controlled substance — the same substance that Ohio health officials call a “psychoactive plant” that produces a “heroin-like high.” Ohio will soon join five other states in banning the sale and possession of kratom. 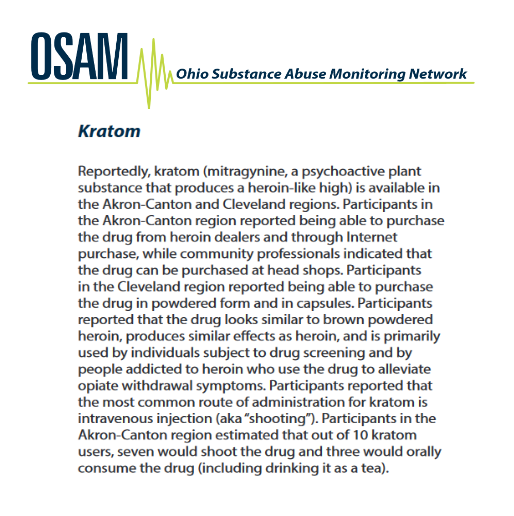 But there’s not a word about kratom in the National Drug Threat Assessment. There never has been. Kratom comes from the leaves of a tree that grows in southeast Asia, where it has been used for centuries as a natural pain reliever and stimulant. In recent years, millions of Americans have discovered kratom and use it to self-treat their chronic pain, addiction, anxiety and depression. Nearly 200 people were sickened in the outbreak, but no one died and the CDC never identified the source of the salmonella. 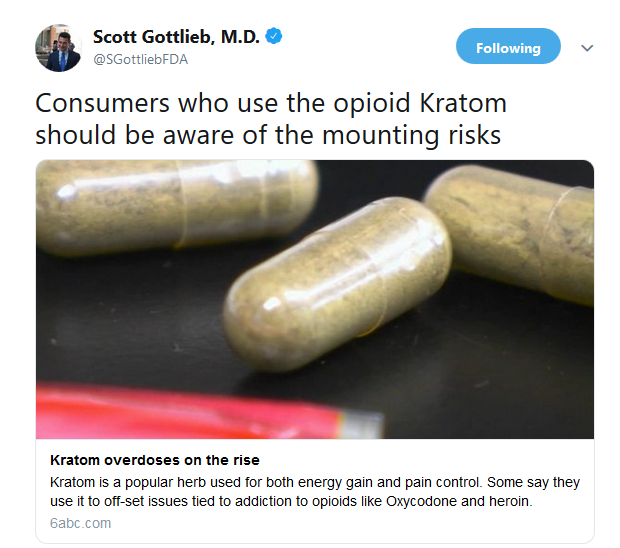 FDA commission Scott Gottlieb, MD, has taken to calling kratom an “opioid” (its active ingredients are alkaloids) and regularly tweets that consumers “should be aware of the mounting risks” of using the herb. Yet there’s been no mention of kratom in the DEA’s annual assessment of drug risks in the United States. The Food and Drug Administration has ended its investigation of a small salmonella outbreak linked to kratom – but not without taking some parting shots at the herbal supplement used by millions of Americans to treat chronic pain, addiction, depression and other conditions. “It appears the salmonella problem with kratom uncovered earlier this year has probably been occurring for some time and is ongoing. We have closed our outbreak investigation, concluding that anyone consuming kratom may be placing themselves at a significant risk of being exposed to salmonella,” said FDA commissioner Scott Gottlieb, MD, and Stephen Ostroff, MD, FDA Deputy Commissioner for Foods and Veterinary Medicine, in a lengthy joint statement. The FDA ended its investigation five weeks after the Centers for Disease Control and Prevention wrapped up its own probe of the salmonella outbreak that sickened 199 people in 41 states. The CDC investigation began in February of this year, but salmonella illnesses linked to kratom were traced back as far as January 2017. No single source of the outbreak was ever identified, but kratom was considered the “likely source.” A little over half of the 81 kratom samples that were analyzed tested positive for strains of salmonella bacteria. Kratom comes from the leaves of a tree that grows in southeast Asia, where it has been used for centuries as a natural pain reliever and stimulant, particularly in rural areas of Indonesia and Thailand. “In these locations, the plant is being grown, harvested and processed in problematic conditions that readily create the circumstance for widespread contamination with foodborne pathogens. Although some of the kratom is further processed once in the United States into capsules, powders or herbal remedies, based on our findings, these procedures do not appear to be eliminating microbial contamination,” wrote Gottlieb and Ostroff. In recent years, millions of Americans have discovered kratom and started buying it online or in convenience stores and “head shops.” But not until this year did federal health officials show any concern that kratom products were contaminated with salmonella bacteria. Their primary focus was that kratom was being marketed as an unapproved medical treatment, particularly for pain and addiction. 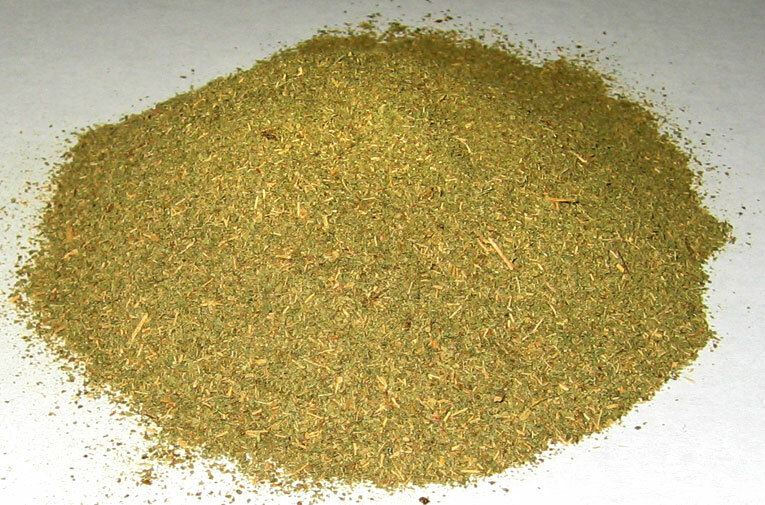 Over a dozen kratom products were recalled during the FDA and CDC salmonella investigations. Salmonella is a bacterial infection usually spread through contaminated food or water. Most people who become infected develop diarrhea, fever and stomach cramps. Severe cases can result in death. There have been several other salmonella outbreaks this year, including infections linked to melons, raw sprouts, dried and shredded coconut, live poultry, chicken salad, pet guinea pigs, and Kellogg’s Honey Smacks cereal. “This outbreak investigation is over. 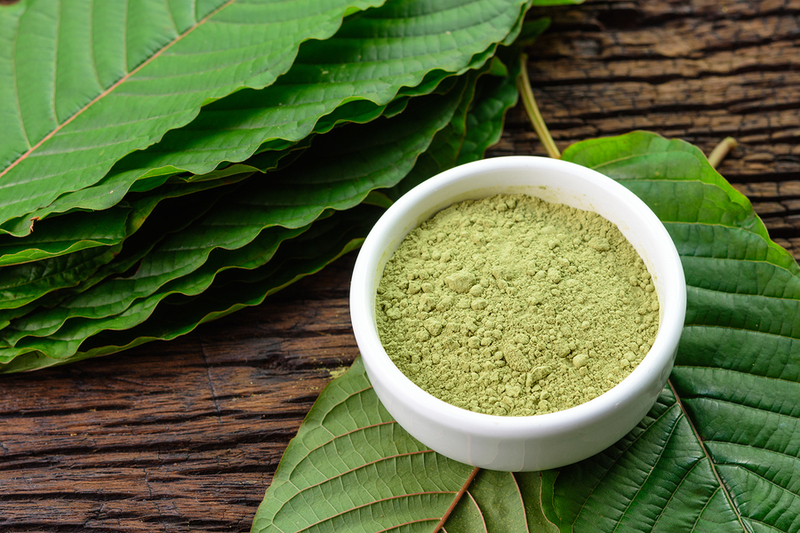 However, some kratom products that were contaminated with Salmonella have not yet been recalled and may still be available for purchase or in people’s homes,” the CDC said in a statement. “Salmonella was identified in nearly half of the kratom products tested during this investigation. Eighty-five different DNA fingerprints of Salmonella were identified in samples of kratom products. This information indicates widespread Salmonella contamination in kratom from multiple retailers." The CDC has modified a previous recommendation that no one consume kratom “in any form.” The agency now recommends that only people at risk of a Salmonella infection – such as pregnant women, children, older adults, and people with compromised immune systems -- avoid consuming kratom products. The U.S. Food and Drug Administration has stepped up its campaign against the herbal supplement kratom by sending warning letters to three distributors of kratom products – the latest effort in what appears to be a concerted government effort to stop all sales of the herb. Front Range Kratom, Kratom Spot and Revibe are accused of illegally selling unapproved “drug products” and making unproven claims about kratom’s ability to treatment opioid addiction, chronic pain and other medical conditions. The FDA and the Centers for Disease Control and Prevention have previously warned consumers not to consume any kratom products. The CDC said kratom was the “likely source” of a small salmonella outbreak, while the FDA alleged that kratom has opioid-like qualities and could lead to addiction and overdose. “Despite our warnings that no kratom product is safe, we continue to find companies selling kratom and doing so with deceptive medical claims for which there’s no reliable scientific proof to support their use,” FDA Commissioner Scott Gottlieb, MD, said in a statement. Kratom comes from the leaves of a tree that grows in southeast Asia, where it has been used for centuries as a natural stimulant and pain reliever. In recent years, millions of Americans have discovered kratom and started using the herb as an alternative to prescription drugs for treating chronic pain, anxiety, depression, and addiction. Those testimonials from kratom users can’t be found on the website today. FDA investigators are also monitoring the social media sites of kratom vendors. Last October, Kratom Spot shared on its Facebook page a CNN story about kratom as a possible treatment for pain and opioid addiction. The company only said the story was “positive news for kratom as... an all natural alternative.” But the FDA said that amounted to the illegal marketing of an unapproved drug. “The claims on your website and social media sites establish that your kratom products are drugs… because they are intended for use in the diagnosis, cure, mitigation, treatment, or prevention of disease—in particular, for opiate withdrawal and addiction,” the warning letter states. It probably didn’t help that Kratom Spot shared a picture on its Facebook page of hundreds of kratom orders being readied for shipment by another federal agency -- the U.S. Postal Service. The threat of legal action can be all that it takes to drive a kratom vendor out of business. 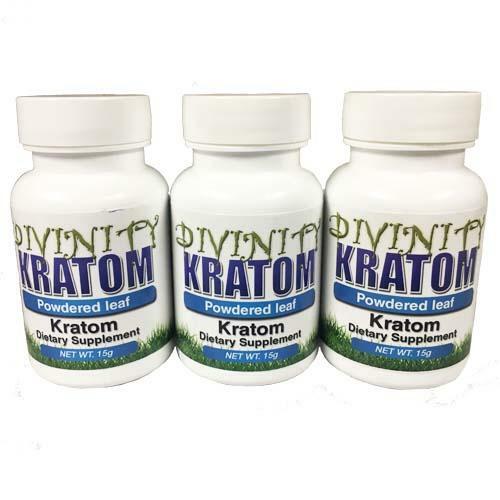 In February, the FDA forced Divinity Products Distribution to recall and stop selling kratom products. The FDA said the company agreed to the “voluntary destruction” of its kratom products, even though there were no reports of illnesses associated with them. The Centers for Disease Control and Prevention says another 45 people have been sickened in a salmonella outbreak linked to the herbal supplement kratom. A total of 132 people have been infected in 38 states, with 38 of them hospitalized. There have been no deaths. Salmonella is a bacterial infection usually spread through contaminated food or water. Most people who become infected develop diarrhea, fever and stomach cramps. Salmonella causes an estimated one million food-borne illnesses a year in the United States. This particular outbreak is small compared to previous ones, but it’s been long-lasting. While the vast majority of cases have only been reported in the last few months, CDC traced the first illnesses back to January 2017. Three different Salmonella strains have been identified – none of them resistant to antibiotics. Millions of Americans use kratom to treat chronic pain, addiction, depression, anxiety and other medical conditions. The CDC says kratom is the “likely source” of the outbreak – although the evidence behind it is not entirely clear. Several kratom samples have been found to be contaminated with salmonella bacteria, but less than half the people sickened in the outbreak say they consumed kratom. Their ages are also unusual, ranging from 1 to 73 years old. “State and local health officials continue to interview ill people to ask about the foods they ate and other exposures before they became ill. Fifty-seven (73%) of 78 people interviewed reported consuming kratom in pills, powder, or tea,” the CDC said in its latest update. Earlier this week, the Food and Drug Administration ordered a Las Vegas company – Triangle Pharmanaturals -- to recall all of its dietary supplements containing kratom. The rare mandatory recall order was issued after the company refused to make a voluntary recall when some of its kratom capsules were found contaminated with salmonella. There other kratom distributors – PDX Aromatics, Tamarack and NutriZone voluntarily recalled their products after samples tested positive for salmonella. A complete list of recalled kratom products can be found here. Many kratom supporters remain suspicious of the motives behind the federal government’s salmonella investigation. The Drug Enforcement Administration tried unsuccessfully to list kratom as a controlled substance in 2016, which would have effectively banned its sale and use. In recent months, the FDA has also released several warnings that kratom should not be used to treat any medical conditions because it has opioid-like properties and could cause addiction. The American Kratom Association (AKA) – a pro-kratom association of consumers and vendors -- is currently surveying members “to get a clearer picture” of the actions taken by the FDA and CDC in the salmonella outbreak. Among other things, the survey asks vendors if they were given a laboratory analysis of any “alleged salmonella contamination” by the FDA or CDC, and if they were given time to conduct their own independent lab test. The U.S. Food and Drug Administration has issued a mandatory recall for kratom capsules made by a Las Vegas company after several of its products were found to be contaminated with salmonella bacteria. The FDA said it ordered the recall after Triangle Pharmanaturals failed to cooperate with the agency’s request to conduct a voluntary recall. The FDA is advising consumers to discard kratom products made by Triangle, which include Raw Form Organics Maeng Da Kratom Emerald Green, Raw Form Organics Maeng Da Kratom Ivory White, and Raw Form Organics Maeng Da Kratom Ruby Red. The products are sold in 300 capsule plastic bottles. It’s possible other brands may be included in the recall because Triangle manufactures and packages kratom products for other companies. “This action is based on the imminent health risk posed by the contamination of this product with salmonella, and the refusal of this company to voluntarily act to protect its customers and issue a recall, despite our repeated requests and actions,” said FDA Commissioner Scott Gottlieb, MD, in a statement. The FDA said Triangle did not cooperate with its investigation or order a voluntary recall after six samples of its kratom products tested positive for salmonella. “FDA investigators were denied access to the company’s records relating to potentially affected products and Triangle employees refused attempts to discuss the agency’s findings,” the FDA said. At least 87 people have been sickened in 35 states by a salmonella outbreak linked to kratom – an herbal supplement used by millions of Americans to treat chronic pain, depression, anxiety and addiction. At least one other kratom distributor – PDX Aromatics of Portland, Oregon – agreed to voluntarily recall its products after several were found contaminated with salmonella. Salmonella is a bacterial infection usually spread through contaminated food or water. Most people who become infected develop diarrhea, fever and stomach cramps. Severe cases can result in hospitalization or even death. The FDA has also warned against consuming kratom, claiming it has opioid-like qualities and could lead to addiction. In recent months, the FDA has released a public health advisory warning that kratom should not be marketed as a treatment for any medical condition. The agency also released a computer analysis that found kratom contains over two dozen opioid-like substances. Under the Food Safety Modernization Act, the FDA has broad authority to order the recall of food products when the agency determines that there is a reasonable probability the food is adulterated or could have serious health consequences. The number of people infected by a Salmonella outbreak linked to the herbal supplement kratom has more than doubled – with 87 illnesses now reported. Twenty-seven people have been hospitalized, according to a new CDC report. 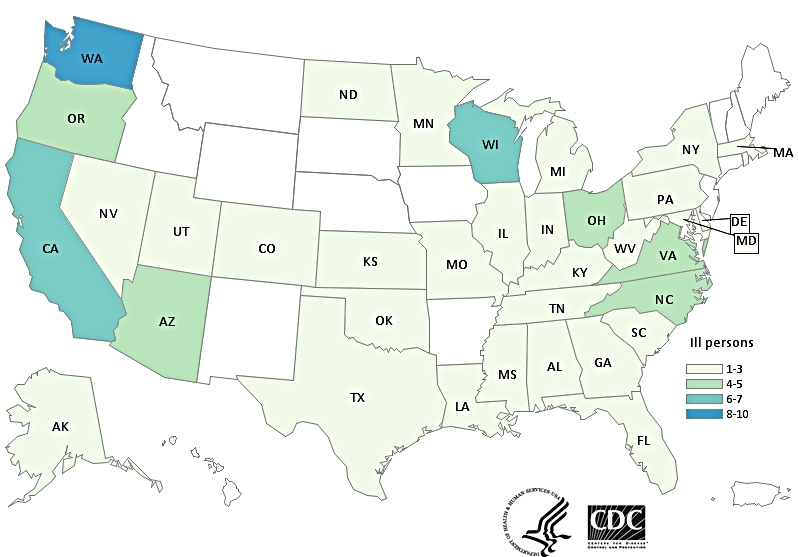 Although this particular outbreak is small – there are about one million Salmonella cases every year in the U.S. – it covers a lot of territory. Illnesses have been reported in 35 states from New York to California. No deaths have been reported. Evidence is also increasing that the outbreak involves kratom, an herbal supplement that millions of Americans use to treat chronic pain, depression, anxiety and addiction. In a survey of 55 patients sickened in the outbreak, 40 said they had consumed kratom in pills, powder, or tea. Most reported consuming kratom in powder form. The origin of the contaminated kratom has not been identified, but three brands of kratom sold by PDX Aromatics of Portland, Oregon have been recalled. Health officials in California collected leftover kratom powder from one of PDX's brands (Phytoextractum) from an ill person in California, and the outbreak strain of Salmonella was identified in the sample. PDX blames the contamination on an unidentified "supplier" that it is no longer taking shipments from. Investigators in Oregon and Utah have also collected kratom powder from retail locations and online retailers where ill people reported purchasing kratom. Outbreak strains of Salmonella Okatie and Salmonella Thompson were identified in those samples. No brand information was available for the kratom collected in Oregon. The ill person in Utah purchased kratom powder from the website kratoma.com. In a statement on its website, Kratoma said it "would not restock any kratom in future" and would close its online store by March 31, 2018. The CDC now traces the start of the outbreak back to January 2017. The CDC says there could be more than the current count of 87 cases, because it takes an average of two to four weeks for a Salmonella illness to be reported. Salmonella is a bacterial infection usually spread through contaminated food or water. Most people who become infected develop diarrhea, fever and stomach cramps. Salmonella causes an estimated one million food-borne illnesses a year in the United States, with 19,000 hospitalizations and 380 deaths. Last month the Food and Drug Administration recalled three brands of kratom made by Missouri-based Divinity Products. The company agreed to the “voluntary destruction” of its kratom products, even though there have been no reports of illnesses associated with them. A kratom wholesaler and retailer based in Oregon is recalling three brands of the herbal supplement that may be contaminated with Salmonella bacteria. PDX Aromatics of Portland, Oregon said the recall involves 10,000 packages of kratom powder that were sold to customers between January 18, 2018 and February 18, 2018 through company websites, under the brand names Kraken Kratom, Phytoextractum and Soul Speciosa. “PDX Aromatics has identified a supplier in our supply chain as the source of Salmonella. The company has removed that supplier from our supply chain and all associated products from our facility. We have ceased distribution of products in order to perform a facility audit and have initiated a voluntary recall," the company said in a statement on its website. The company said it was notified by health officials in California that “certain lots of the product” tested positive for Salmonella bacteria and that there was one confirmed illness associated with its kratom powder. The Centers for Disease Control and Prevention announced last month that it was investigating a Salmonella outbreak linked to kratom – an herbal supplement imported from southeast Asia that millions of Americans use to treat chronic pain, addiction, depression and anxiety. At least 40 people have been sickened by the outbreak in 27 states. Seventeen of them said they had consumed kratom in pills, powder or tea. Most said they had bought kratom online, but some purchased it at retail locations. The first illnesses were reported in October 2017 – three months before the timeline of kratom products involved in the PDX Aromatics recall. Until a common source of Salmonella bacteria is identified, the CDC has recommended that people stop consuming all kratom products. PDX Aromatics said customers would receive a full refund once the recalled kratom products are returned. A complete list of the brands and lot numbers involved in the recall can be found here. Last month the Food and Drug Administration recalled three brands of kratom dietary supplements made by Missouri-based Divinity Products. The company agreed to the “voluntary destruction” of its kratom products, even though there have been no reports of harm or illnesses associated with them. The Centers for Disease Control and Prevention says a dozen more people have been sickened by a Salmonella outbreak linked to the herbal supplement kratom – raising to 40 the number of suspected cases. The number of states where the illnesses have been reported rose from 20 to 27. For the first time, investigators have also found Salmonella bacteria linked to the outbreak in kratom powder samples in North Dakota and Utah. “The outbreak strain of Salmonella was identified in both samples. The ill person in North Dakota purchased S.K. Herbalist brand kratom powder from the website soapkorner.com. The ill person in Utah purchased kratom powder from the website kratoma.com,” the CDC said in a statement. State and local health officials have interviewed 24 people sickened by Salmonella, asking them about food and other substances they were exposed to before they became ill.
Seventeen of the 24 reported consuming kratom in pills, powder, or tea. Three said they purchased kratom from retail locations and 10 said they bought kratom online. Illnesses from the Salmonella outbreak began last October, with the most recent case reported on February 13. Fourteen people have been hospitalized. No deaths have been reported. It generally takes about two to four weeks before a person infected with Salmonella is reported, so its possible there could be more than 40 cases in the current outbreak. Kratom comes from the leaves of a tree that grows in Southeast Asia, where it has been used for centuries for its medicinal properties. In recent years, millions of Americans have started using kratom to treat chronic pain, depression, anxiety and addiction, conceivably costing the pharmaceutical industry billions of dollars in lost revenue. 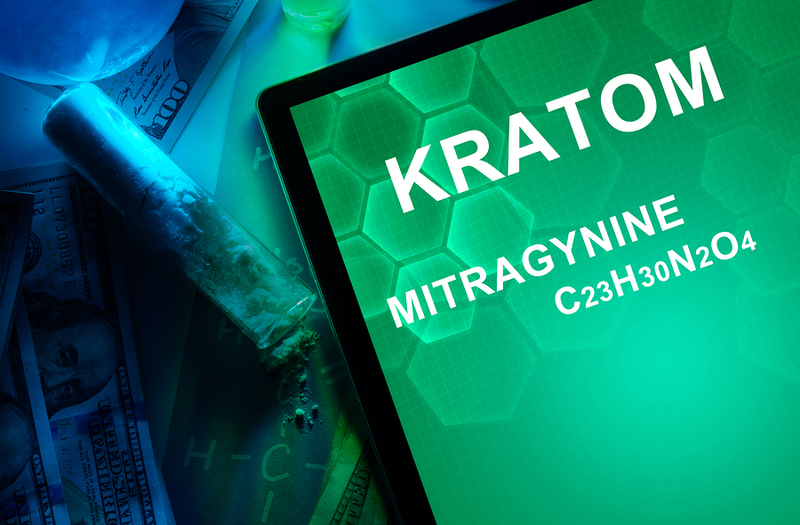 In a move apparently unrelated to the Salmonella outbreak, the Food and Drug Administration warned a Utah company this week not to launch a new dietary supplement that is based on mitragynine -- one of the alkaloids found in kratom. “Today, we notified a company making claims for a compound in kratom that its product is an unapproved new drug and an adulterated dietary supplement,” FDA commissioner Scott Gottlieb, MD, said in a statement. Industrial Chemicals planned to start selling Mitrasafe on February 28. A spokesman for the company said the launch date has been postponed while it appeals the FDA decision. “We did not make any drug claims. On the contrary. We did not claim that Mitrasafe itself could do these things or have opium like qualities at all. We never even came close,” said attorney John VanOphem. “The FDA wants to be taken seriously on this stuff? I’m sorry, they haven’t followed their own guidance. This is alarming to me. To have us become the whipping boy poster child on this is just outrageous." VanOphem told PNN the company has spent years trying to work with the FDA to get Mitrasafe approved. Unlike pharmaceutical drugs, dietary supplements like kratom are -- for the most part -- loosely regulated by the FDA. But in recent months the agency has launched an unprecedented public campaign to discourage people from using kratom. In November, the FDA released a public health advisory warning about kratom's potential health risks, especially when used to treat opioid addiction. Last month the agency released a computer analysis that alleged kratom contains over two dozen opioid-like substances that share structural similarities to painkillers such as morphine. “Kratom should not be used to treat medical conditions, nor should it be used as an alternative to prescription opioids. There is no evidence to indicate that kratom is safe or effective for any medical use. And claiming that kratom is benign because it’s ‘just a plant’ is shortsighted and dangerous,” Gottlieb said in a statement. In 2016, the Drug Enforcement Administration attempted to ban kratom by scheduling it as an illegal controlled substance, but a public outcry and lobbying campaign forced the DEA to suspend its scheduling decision. Many kratom supporters fear that another attempt to ban kratom is imminent. The move appears unrelated to Tuesday’s warning from the CDC linking kratom to a Salmonella bacteria outbreak in 20 states. The CDC said 8 of the 28 people who were sickened by Salmonella had recently used kratom, making it the "likely source." No actual bacteria was found in a kratom product. In recent months, the FDA has released a public health advisory warning that kratom should not be marketed as a treatment for opioid addiction, chronic pain, depression or any other medical condition. The agency also released a computer analysis that found kratom contains over two dozen opioid-like substances. “We’re in for a fight,” said David Herman, president of the American Kratom Association, a pro-kratom consumer group. “This is clearly a disinformation campaign. They are creating through a grassroots effort what they can’t seem to be able to (prove) with science. Herman said any renewed attempt to schedule kratom as a controlled substance would have to go through a public comment and hearing process, which could take a year or longer. He sees it as part of a larger effort by the FDA to have greater control over the loosely regulated dietary supplement industry. Kratom just can’t get a break. In recent weeks, the herbal supplement used by millions of Americans to treat chronic pain, depression and addiction has been blamed by federal agencies for dozens of fatal overdoses and even been called an opioid. Now the Centers for Disease Control and Prevention has linked kratom to a salmonella outbreak and is recommending that people "not consume kratom in any form." The bacterial infection has sickened 28 people, eleven serious enough to be hospitalized, but there have been no deaths. The outbreak began in October 2017 and has reached 20 states scattered around the country, which are highlighted in the map below. “Epidemiologic evidence indicates that kratom is a likely source of this multistate outbreak,” the CDC said in a statement. “In interviews, ill people answered questions about the foods they ate and other exposures in the months before they became ill. Eight (73%) of 11 people interviewed reported consuming kratom in pills, powder, or tea. No common brands or suppliers of kratom have been identified at this time." The CDC statement did not say that Salmonella bacteria had actually been found in any samples of kratom. Nor did it explain how kratom use in 8 out of 28 cases establishes a link or proves that it was "a likely source." The only "epidemiologic evidence" that investigators have established is that when they compared bacteria samples from people who were infected, they found the bacteria were closely related genetically. "This means that people in this outbreak are more likely to share a common source of infection," the CDC said. "At this time, CDC recommends that people not consume kratom in any form. The investigation indicates that kratom products could be contaminated with Salmonella and could make people sick." In the current outbreak, the CDC says there could be more cases than the 28 reported, because salmonella infections typically take 2 to 4 weeks before the illnesses are confirmed. It was a July 2016 report from the CDC that claimed kratom was linked to several overdose deaths and was “an emerging public health threat” that led the Drug Enforcement Administration to attempt to schedule kratom as an illegal controlled substance. Kratom supporters said the CDC research was amateurish and flawed, and a public outcry and lobbying campaign eventually forced the DEA to suspend its scheduling decision. Earlier this month, the Food and Drug Administration released a computer analysis that found kratom contains over two dozen opioid-like substances – a report that critics say was biased and amounted to “junk science.” The computer analysis and a recent FDA public health advisory may indicate the federal government is planning another attempt at scheduling. Kratom comes from the leaves of a tree that grows in Southeast Asia, where it has been used for centuries for its medicinal properties. The herbal supplement kratom contains opioids and should not be used to treat any medical condition, according to a new analysis by the U.S. Food and Drug Administration. The report seems likely to trigger a renewed effort to classify kratom as an illegal Schedule I substance under the Controlled Substances Act. “Kratom should not be used to treat medical conditions, nor should it be used as an alternative to prescription opioids. There is no evidence to indicate that kratom is safe or effective for any medical use. And claiming that kratom is benign because it’s ‘just a plant’ is shortsighted and dangerous,” said FDA Commissioner Scott Gottlieb, MD, in a lengthy statement. Kratom comes from the leaves of a tree that grows in southeast Asia, where it has been used for centuries for its medicinal properties. Millions of Americans have discovered kratom in recent years, using it to treat chronic pain, anxiety, depression, and addiction. In 2016, the Drug Enforcement Administration attempted to list two of kratom’s active ingredients as Schedule I substances. The DEA suspended its plan after a public outcry, and said it would wait for a scheduling recommendation and medical evaluation of kratom from the FDA. The new report may prompt the DEA to try again. In a computer analysis using what the FDA calls Public Health Assessment via Structural Evaluation (PHASE) methodology, FDA researchers identified 25 chemical compounds in kratom that share structural similarities with opioid analgesics such as morphine. Like painkillers, the substances bind to mu-opioid receptors in the brain and – according to the computer models -- act the same way as opioids. “The data from the PHASE model shows us that kratom compounds are predicted to affect the body just like opioids. Based on the scientific information in the literature and further supported by our computational modeling and the reports of its adverse effects in humans, we feel confident in calling compounds found in kratom, opioids,” Gottlieb said. Critics of the FDA analysis say it contains numerous errors and signs of confirmation bias. "The failure of the FDA to justify its attempt to schedule kratom using traditional and well-accepted scientific methods has apparently driven the FDA to move into the world of junk science. Using computer modeling is very susceptible to bias in the assumptions the are built into the computer algorithms. In short, the old adage of 'garbage in – garbage out' applies to such dramatic testing standards," said Dave Herman, chairman of the American Kratom Association (AKA), a pro-kratom consumer group. In addition to its analysis, the FDA released a detailed report on 36 deaths associated with kratom over the past several years. The agency admits all but one of the overdose deaths involved other drugs and “could not be fully assessed.” There was only one death involving a person who had no prior opioid use. “We’re continuing to investigate this report, but the information we have so far reinforces our concerns about the use of kratom. In addition, a few assessable cases with fatal outcomes raise concern that kratom is being used in combination with other drugs that affect the brain, including illicit drugs, prescription opioids, benzodiazepines and over-the-counter medications, like the anti-diarrheal medicine, loperamide,” Gottlieb said. 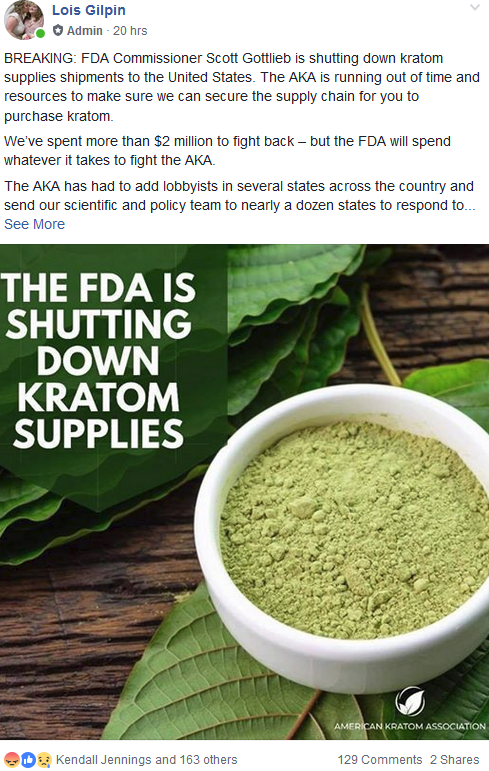 "It is more of the same useless rhetoric from FDA," says Jane Babin, a molecular biologist who authored a report last year for the AKA that discredited many of the reports linking overdoses to kratom. "Bottom line: 36 deaths over 3, 5, 7 or more years that they can't prove were caused by kratom, versus 16,000 deaths from killer street opioids," Babin wrote in an email. “I've had several friends who have died from heroin overdose. If they knew about kratom they may still be alive today,” wrote another kratom user. One of the dilemmas faced by the FDA and DEA is that kratom products are currently classified as dietary supplements, and there are few regulatory standards applied to their importation or ingredients. The only requirement for kratom vendors is that they don't make unsubstantiated health claims. Classifying kratom as a Schedule I controlled substance would radically change that, making it a felony to possess or sell kratom, and likely creating an underground black market for the herb.